So.....basically I can move like 5 feet. Awesome. hehe.u played skateboard wearing dress. i love your red dress ! Haha glad to know I'm not alone! lol. hah, i love this photos! you look wonderful in this dress! You girl rock with that strawberry red dress! Love it! Very nice! 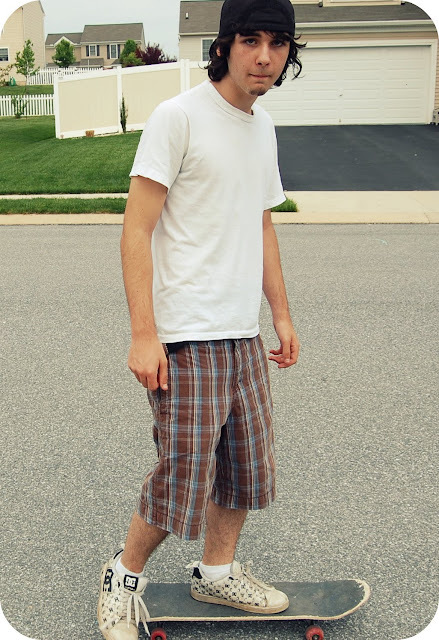 My boyfriend is a skater too! I can get from here to there, but nothing fancy for me. Try it with tennis shoes- it makes a HUGE difference! I love the colour of your dress. At least you are standing on your own! I had the humiliation of gripping onto my Boyfs hand for dear life...with witnesses...and screaming...well more like a turkey gobbling. Thanks everyone! I'm glad I survived as well! Haha next time I will try with tennis shoes. probably better than sandals! You two are so friggin cute. I think I will puke lol Umm yeah last skateborading for me ended in a$$ - oops. 5 feet now, next time gonna be 10! you can do it sweetie! haha, youre adorable. and skating in a pretty dress? loves it. That dress color is so gorgeous! You look adorable riding on on that skateboard in your little red dress!